Caring for patients in New York City since 1998. Affiliated with leading hospitals New York Presbyterian Hospital, and Hospital for Special Surgery. Fluent in English, Chinese (Mandarin), conversational Arabic, with more than 20 years of experience, Dr. Sun is a board certified neurologist with affiliations at both New York Presbyterian Hospital-Weill Cornell Medicine and Hospital For Special Surgery. Additionally, he actively teaches as a clinical professor of neurology at Weill Cornell Medical College. Dr. Sun obtained his fellowship at Massachusetts General Hospital at Harvard University after completing his neurology residency at New York Presbyterian Hospital, Cornell University Medical Center and Memorial Sloan Kettering Cancer Center. 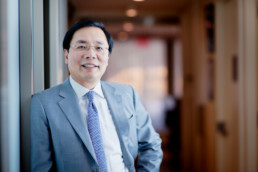 Prior to his M.D, Dr. Sun received his Ph.D. in molecular neurobiology from University of Wisconsin-Madison in 1991 and completed a Post-doctoral Fellowship at Rockefeller University. Dr. Sun is a member of the American Academy of Neurology and the American Academy of Neuromuscular and Electrodiagnostic Medicine. He is also listed in the American Registry of Outstanding Professionals and is the Co-Chairman of the National Republican-Medical Advisor. With patients from all over the world, Dr. Sun’s high-level of medical skill and experience is indisputable. Establishing his practice in 1998, Dr. Dexter Sun provides his patients with comprehensive and exceptional personal healthcare management. With experience in Western and Chinese medicine, Dr. Sun takes a unique approach to keeping his patients healthier, for longer. Located on the Upper East Side adjacent to leading hospitals like Hospital for Special Surgery, New York Presbyterian Hospital, and Memorial Sloan Kettering Cancer Center, Dr. Sun’s office is a hub for those seeking the best neurological services and personalized healthcare plans. To learn more, call us at (212) 717-8282 or contact us here. 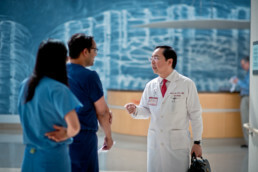 Dr. Sun works closely with more than 50 doctors affiliated at Memorial Sloan Kettering, New York Presbyterian, Hospital for Special Surgery, spanning specialties like cardiologists, oncologists, orthopedic surgeons, OBGYN, dermatologists, and much more. Healthcare is complicated, which is why Dr. Sun takes an average of one hour to consult with new patients and why we work with different physicians who are at the top of their fields. Dr. Sun makes it a priority to always be accessible, because in times of health, we know our patients deserve to get answers right away. Text, call, or email, Dr. Sun and he will respond within a few hours. With Dr. Sun create a personal healthcare plan that includes medicine, nutrition, exercise, mental health, and more. Get closer to your long term health goals at your own pace.